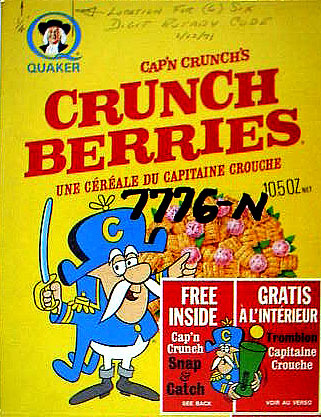 Pamela Low, who created the flavored coating of Cap'n Crunch cereal, died on Friday at age 79. After graduating in 1951 from the University of New Hampshire with a microbiology degree, she took a job as a flavorist at Arthur D. Little. The Cap'n Crunch flavor was inspired by a treat made by her grandmother. "Grandma would make this concoction with rice and the sauce that she had; it was a combination of brown sugar and butter," Ms. Low's brother William of Westerville, Ohio, said with a chuckle. "It tasted good, obviously. They'd put it over the rice and eat it as a kind of a treat on Sundays..."
Taking a job at Arthur D. Little (in the early 1950s), she became a flavorist, a scientific connoisseur of the artificial tastes that tempt consumers to return for more. She tinkered with flavors of products such as Almond Joy and Mounds, but her biggest achievement came when Quaker Oats developed a new cereal. "I developed the flavoring, the coating," she told UNH Magazine in 2002. 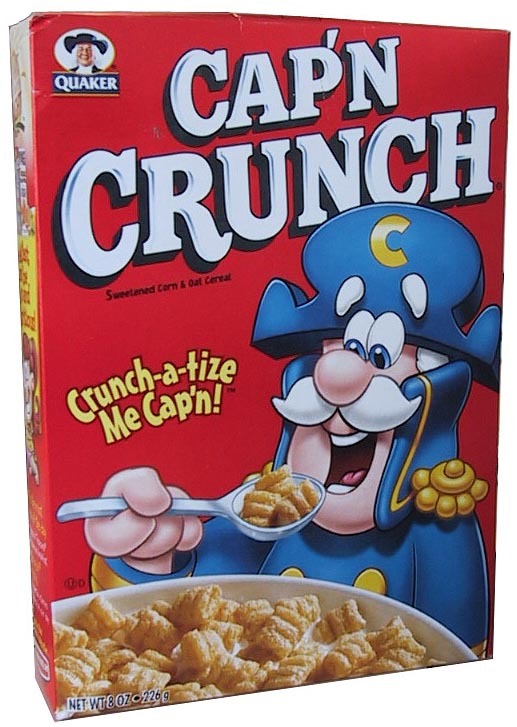 Seeing the obituary for the creator of Cap'n Crunch's flavor coating, I couldn't help notice that poor Cap'n Crunch has unfortunately undergone the same downgrade makeover that so many packaging characters have fallen prey to. Mark has pointed this out numerous times before (remember the poor Trix rabbit? ).